Color and Personality: Is there a Link? It has been said that you shouldn’t judge a book by its cover, but can we indeed see some of a person’s personality traits by knowing their favorite color and their color choices in the clothes they wear? Studies have shown that there is sometimes an interesting connection between a person’s favorite color, the colors of clothes they choose to wear, and their personality. 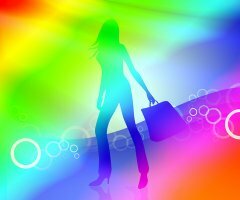 Many psychologists strongly believe a person’s favorite colors can reveal many parts of their personality. They believe a person’s favorite color can sometimes have the ability to reveal their conscious motives, traits, values, and even some causes of psychological stress. This belief is called Color Psychology. Some psychologists even have Color Diagnostic tests available that are believed to determine your personality traits from your favorite colors. Some of these tests have been used as far back as 1949. Some psychologists believe that by revealing a person’s personality traits it can help assist them in having a better understanding of themselves and their actions. Psychologists believe that ultimately this can help a person to improve their relationships and accomplish certain goals. Not only is there a connection between a person’s favorite color and their personality, but a person’s color choices in clothes has also been known to indicate certain parts of their personality traits. It is believed that the colors you choose to wear can reveal your interests, desires, tastes, and more. For example, generally, when people mix different colors of clothing to create their outfit it implies that they have a sense of uniqueness and creativity in their personality. When people wear dark colors it is known to show authority, or a need for a sense of power and control to hide emotional insecurities. Bright colors such as red and yellow indicate a bubbly personality and a positive outlook. The colors you choose to wear may not only make a fashion statement, but may also reveal a glimpse into your inner self as well. Find out your best fashion palette with a Personal Color Analysis kit, or schedule a consultation.